In my recent post on butter, Butter or Margarine on Bread?, I wrote about why butter is a better option. 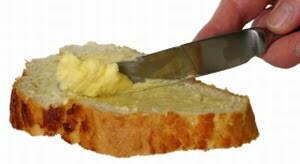 Here we’ll look at types of butter and how to make your own butter and soft butter spread. Butter is mostly made form cows’ milk. In the past, cream was collected from the raw milk and then churned. This was and still is the best butter, also known as raw cultured butter. Cultured butter in the shops isn’t made the old-fashioned way. It’s rather made with pasteurised cream and cultures are added to finished butter. Unsalted (also called continental) butter is made as above without bacterial cultures added. Salted butter as the name says, has salt added. Organic butter is made with organic cream without any additives. The best choice would be homemade organic raw cultured butter. However, unless you have your own cows or access to organic raw milk, it’s close to impossible to get it. As said above, to make raw cultured butter from scratch you’d need raw milk (and lots of it!). Alternatively, you can buy cream and make your own. Use cream with the highest fat percentage, 35% plus. Pour it into a deep bowl and using a mixer beat until stiff. Continue beating until some liquid starts to separate and cream turns yellow. It will take some time. 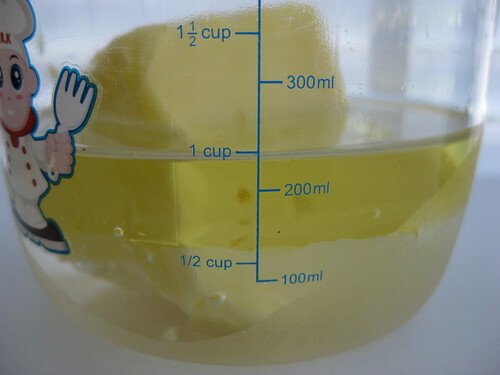 When butter forms, press it together to expel liquid, put in a container and refrigerate. In my opinion, this method isn’t worth the time and money. When you calculate the cost of cream + time, butter is cheaper. Though it is good to know the method in an emergency: you need butter for a cake let’s say, the shop is closed or too far to drive but you have some cream in the fridge! I’ve seen in the shops some butter spreads claiming to be spreadable. They have oils added or water content increased. So I decided to try it at home hoping that butter and oil won’t separate– it worked! Butter naturally contains lecithin. Lecithin is emulsifier – a substance that binds water and oil. The first time I made soft butter spread was about 2 years ago. Since then I’ve played with different oils and ingredients. For the basic recipe you need a quantity of softened butter and oil of your choice (try to use good quality cold pressed extra virgin oil). Also, I like to add water – it makes the spread a bit brittle, but there are fewer calories. Put all ingredients in a bowl and mix using a handheld stick blender, mixer, food processor or a whisker until all the ingredients are blended together. The spread will be shiny but turn dull when refrigerated. This recipe yields about 370g butter spread. One of my experiments was to mix yoghurt instead of oil – to make a sort of soft cultured butter spread. The result was interesting: instead of combining together, it started to separate a bit and to form little pockets of liquids, as when you make butter from cream! Nevertheless, the taste was really good. That is my favourite soft butter spread as well as spread made with extra virgin olive oil . Our kids like milder tasting oils like macadamia. While butter spread is still soft you can add herbs, garlic or other flavourings. You can see the change in decreased energy and saturated fat fields. I make soft butter spread to have soft butter in the morning, rather than out of worry about the saturated fat or calorie counting. Long before we found about nutritional panels and kilojoules, people knew that foods rich in calories shouldn’t be eaten by kilos.